The Beatles are a great source of music for a wedding. Parents of the couple likely grew up listening to them and then all of the younger guests, including the bride and groom, likely grew up listening to them in the car or around the house. For me, my mom always had on the classic rock station, which played a heaping of Beatles (once or twice a year, they’d play their entire collection over a weekend, from A to Z). 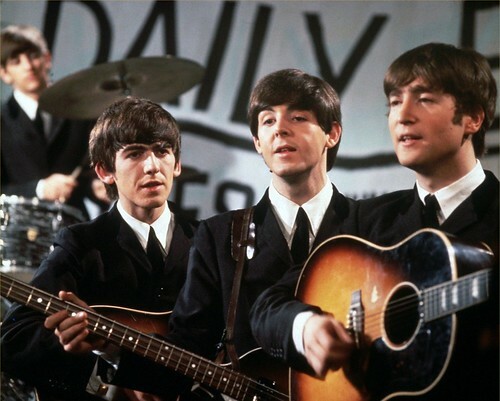 The Beatles can bring together generations and are well known by all and that’s why I play at least one of there songs at almost every wedding. The Beatles – In My Life This one isn’t great for a first dance but could be perfect for the father bride dance or the mother groom dance. The Beatles – Here There and Everywhere This is a really sweet Beatles love song for a wedding. Could be used for a first dance or just during dinner. The Beatles – Twist and Shout I would say that this is one of the most popular wedding songs out ever. It’s easy for people to dance to (they tell you what to do in the song) and it is one the Beatles oldest songs. I personally don’t play it too often as it’s not one of my favs, but I do get to it once in a while and it is guaranteed to get people dancing (if you’re looking for that kind of song. The Beatles – Can’t Buy Me Love This is a great song for a wedding. It talks about love, have a great (easy to dance to) beat and is very well known. The Beatles – Ob-La Di, Ob-La-Da I think that I’ve only played this one once or twice, but it can be a great sing-a-long. The Beatles – A Hard Day’s Night Not quite a guaranteed dance floor hit like the ones above, but another good option with a great dancing beat + it talks about love. The Beatles – With A Little Help From My Friends Another sing-a-long that is somewhere between slow and fast and can be a great end to the night while surrounded by your friends. The songs below are great happy/loving Beatles songs that are too fast for slow dancing (like a first dance) but too slow for a party. The Beatles – Here Comes the Sun One of the only non-love songs on the list. I really like this one though because it is so happy. The Beatles – All You Need Is Love I’ve had a lot of clients use this for their recessional song. I think it’s a great choice. The Beatles – Love Me Do I love to play Love Me Do towards the end of dinner to try to get people in the mood for dancing. It’s an amazing toe-tapping track. The Beatles – When I’m Sixty-Four A bit cliche but still a fun and appropriate song. The Beatles – You Really Got a Hold On Me Another great toe-tapping love song by the Beatles. The Beatles – Blackbird This one is perfect if you’re looking for a sweet background music type song. Looking for songs for your father daughter dance? Well, there are plenty of cheesy choices out on the internet, like Butterfly Kisses or I Loved Her First, which make a lot of brides want to puke. Or how about an inappropriate choice like Daughters by John Mayer (please do not use this). These are not what I’ve found for you. I wanted to make sure to only include songs that aren’t super cheesy or inappropriate. So without any further ado, below you’ll find 27 great songs that you can dance with your dad to. 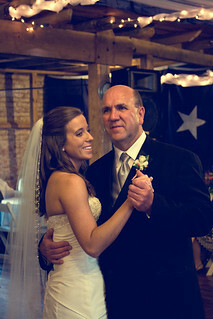 Note: Dancing with just your dad for over 4min can feel REALLY LONG for some brides. I usually find a place in the song between 2:45 and 4min that will sound right to fade out the song for my clients. You may want to do the same. The Temptations – My Girl – Classic song. Everyone knows it and I definitely love it. The Beach Boys – God Only Knows – For a dad who’s daughter is his world. Louis Armstrong – What a Wonderful World Another wedding classic. Perfect for a bride who is looking for something that isn’t sappy. Stevie Wonder – Isn’t She Lovely – Written by a father about his daughter, Isn’t She Lovely is definitely sappy, but still has a fun vibe. Bob Dylan – Forever Young or The Band – Forever Young – a nice choice if your dad is a Dylan or Band fan. Johnny Cash – You Are My Sunshine – Not typical father/bride dance song, but perfect if your dad is a fan of Johnny Cash. Cat Stevens – Wild World This one has a bit of a sad tone, but would be great for a bride and dad who are looking for something a little different. Ray LaMontagne – You Are The Best Thing – If you’re looking for something a little more modern then definitely check this out. Rascal Flatts – My Wish – This one is on the cheesier side, but parents seem to love it, especially if they have little bit of country on their ipod. James Taylor – You’ve Got a Friend – This one is definitely a little sappy and has a bit of a sad tone to it, but if you and your dad want everyone pulling out the tissues, then it could be the perfect choice. Is your groom to be still looking for a song to use to dance with his mom to? Have him check out these 20 amazing mother son dance songs. We have all been to weddings where the father bride dance song was a little too cheesy or slightly incestuous. Here are some music suggestions from Indie Wedding DJ that could be appropriate for a bride and her dad if they are trying to keep the party a little more lively and want to keep their eyes dry. Didn’t find something that you love? Check out these amazing 27 father daughter dance songs.